Researchers from the University of South Carolina created the first ever T-shirt that can be used as a ultra powerful battery but still retain all the normal properties of a conventional shirt. This type of flexible battery might prove useful for soldiers but could also result in a new way to keep all of our mobile gadgets charged while we are on the go. 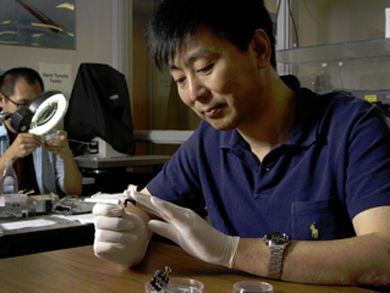 Professor Xiaodong Li from the University of South Carolina department of Mechanical Engineering believes that cotton T shirts could have more functions than just keeping us warm and making us look good – they could also serve as part of our growing ecosystem of mobile technology. More specifically they can be used as flexible energy storage devices. Li began with a T-shirt he bought from a local discount store, which he and his team soaked in a solution of fluoride, dried and baked at high temperature (without any oxygen so it will not simply burn). The result was a shirt with a fabric made of activated carbon instead of the usual cellulose. However unlike many other types of carbon, this one retained its original flexibility and would not break even if folded just like a T-shirt. Wearable and flexible computing might prove to be the next technological revolution “however flexible energy storage device is needed to make this possible.” said Li. He and his team used small swatches of fabric as an electrode and showed that the flexible material, which they call “activated carbon textile”, acts as a capacitor. Capacitors are components of nearly every electronic device on the market, and they have the ability to store electrical charge. In fact, the activated carbon textile acted like a double-layer capacitor, also known as supercapacitors due to their very high energy storage densities. Li and his team decided to improve the activated carbon textile even further. They coated the individual fibers in the activated carbon textile with “nanoflowers” of manganese oxide. A super thin (about nanometer thick), layer of manganese oxide which greatly enhanced the electrode performance of the fabric. According to Professor Li: “This created a stable, high-performing supercapacitor”. Another important property of supercapacitors is how resilient they are to charge-discharge cycles. Many types of batteries degrade quite considerably after 1000-2000 charge-discharge cycles (just think back and remember how your old cell phone or camera battery isn’t as powerful as you remember). Supercapacitors keep their power even after thousands of charge-discharge cycles, and according to Li’s testing the performance of the activated carbon textile didn’t diminish more than 5 percent even after these many cycles. According to Li: “By stacking these supercapacitors up, we should be able to charge portable electronic devices such as cell phones”. Another positive side of this technology has to do with manufacturing the activated carbon textile. “Previous methods used oil or environmentally unfriendly chemicals as starting materials. Those processes are complicated and produce harmful side products. Our method is a very inexpensive, green process.” said Li. More information on the activated carbon textile can be found on the University of South Carolina website.